The PetSafe Smart Feed allows you to control and monitor the feeder at any time from your smartphone, iPhone or Android. With the free-downloading App you can program feeding schedules, portion sizes, monitor your cat’s feeding activity for the last two weeks and also trigger meals in real time by a tap of the “Feed Now” button. PetSafe Smart Feed can be programmed to feed up to 12 meals per day, with portion sizes from 1/8 cup up to 4 cups each meal. SMARTPHONE CONTROLLED: You can fully control your cats feeding schedule anytime, anywhere, using your iPhone or Android. REQUIREMENT: iPhone or iPod device iOS 9.0 or later. Most Android smartphones 5.0 or later. CUSTOMIZABLE MEALS & PORTIONS: You can program up to 12 meal times within 24 hours. Each meal size can be programmed from a minimum of 1/8 cup up to 4 cups at a time. FEED NOW OPTION: If you want to feed your cat an extra meal or snack in real time simply tap “Feed Now” and let your cat enjoy an extra meal. 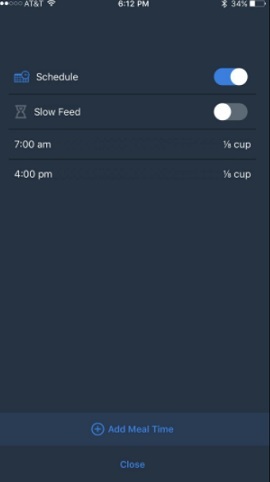 You can choose a minimum of 1/8 cup to 4 cups when triggering a meal in real time. SLOW FEED OPTION: The feeder dispenses meals over a 15-minute period. This option slows down your cat, keeping your pet from inhaling the food. RECEIVE ALERTS: App notifies you if a meal couldn’t be dispensed. 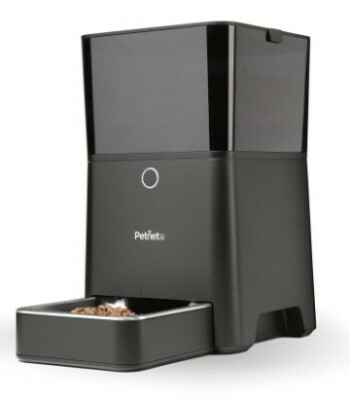 EFFECTIVE DISPENSING SYSTEM: PetSafe Smart Feeder works with an internal conveyor that handles most kibble shapes and sizes, preventing jamming. 24-CUP CAPACITY FOOD HOPPER. Great capacity makes you forget about refilling the feeder often. Translucent food hopper allows you to see the food level at a glance. LOCKING LID: To protect food from mischievous paws. EASY-TO-CLEAN: Hopper, lid, bowl, and bowl holder are top-shelf dishwasher-safe. AC ADAPTER INCLUDED: Includes AC adapter which is the main source of power. Batteries must be used as a backup in case of power outage. (4 D-cell alkaline batteries, not included). 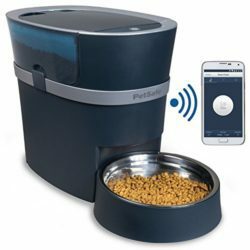 WHAT COMES WITH THE PETSAFE WI-FI FEEDER? 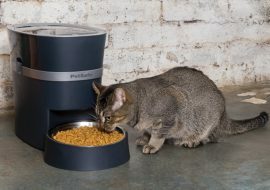 The PetSafe Smart Wi-Fi feeder uses an internal conveyor that escalates the kibble up to the chute to finally drop into the stainless-steel bowl. The unit connects to the WiFi network and to a Smartphone through the App. The App allows you to control the feeding times and portions. Once you program a feeding schedule, it’ll repeat every day. 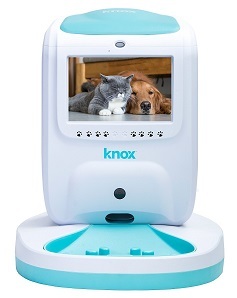 The connection of the feeder to the Wi-Fi allows you to control the unit from your Smartphone, but if the internet fails, the feeder still operates and dispenses the programmed feeding schedule. If a power outage occurs, the battery backup ensures a continuous operation. The lack of internet just means you won’t be able to control the unit from your Smartphone. The feeder is not meant to be used solely with batteries, its main power source it’s AC adapter. The unit doesn’t have a control panel, only a “Feed Now” button that you push if you want the feeder to dispense a meal. All the feeding options are controlled via the App; portions, feeding times, slow feed option and “Feed Now” as well. Simply put the batteries (4 x D alkalines), insert the stainless-steel bowl, fill the hopper with food, plug it in and turn it on. Then download the free App (iPhone or Android), register the unit in the App and connect the feeder to the Wi-Fi router. The food hopper is held shut by two snap locks and the hopper lid is held by a one push lock. Once you fill the feeder with dry food, make sure to “Prime” as instructed, which is basically press the feeder’s front button to dispense a meal until about ¼ cup is dispensed. This “Prime” action of pushing the button allows the food to escalate and fill the conveyor so the food is ready next to the chute to be dispensed. The App allows you to program the feeder up to 12 meals daily. You add one meal, choose the time and portion. Then you add another meal and do the same. The meal times can be set in 15-minute increments only. You can’t, for example, choose a meal for 4:25 pm. The programmed meal times are repeated every day so it’s not possible to program a different feeding schedule ahead of time, for example, program a different portion to be dispensed on the weekend or something like that. What you program is what your cat will eat every day until you change either the # of meals, the time or the portions. Easy to use App provides many features, such as notifications, remote feedings, etc. Power button located at the bottom of the unit prevents kids from turning off the feeder. Groove on the bottom for the cord to sit in. Battery backup to ensure the unit’s operation in case of a power outage. Feeding internal mechanism handles a wide variety of kibble sizes and shapes. Make sure to always keep the hopper with enough food to allow the conveyor to get full and escalate the portions up to the chute. If you fail at doing this, the mechanism starts putting less food into each conveyor compartment and the accuracy of the programmed meals is less. The PetSafe Smart Feed is the Wi-Fi version of the PetSafe Simply Feed. As most automatic Wi-Fi feeders, the Smart Feed can be programmed and controlled by your Smartphone and it allows you to change the settings of the feeder at any time, anywhere. The PetSafe Smart Feed has good accuracy in portions, you just need to make sure to keep the feeder with enough food. The App is easy to use and straightforward. The downfall is the lack of notifications when the feeder is low on food and the lack of a webcam to see or talk to your cat. Also, this feeder needs to be placed away from bedrooms as it’s noisy when the food is dropping into the bowl. Other than that, this feeder works well for cats and provides busy cat owners good control of the feeder and access to change settings from their Smartphone. I recommend this Wi-Fi Smart Feeder. Hi, does the chute have a protector to prevent my cat from getting extra food? I don’t want my cat to be able to get extra food from the chute. 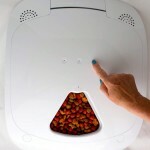 Hello Yinyin, the PetSafe Smart Feed auto feeder doesn’t have a special protector but instead, it has a special chute that prevents cats from stealing the food. Cats simply won’t be able to get food from this chute. To get one piece of kibble from the chute takes for the cat to stick its entire arm inside up the chute and move around its arm with a lot of strength and patience to get one piece of kibble, sometimes none. If your cat is a very special and persistent feline and you think it could do something like this (very rare) I wouldn’t recommend it, instead, I would suggest you to get the Honey Guaridan S25. You can check my review here. Does this feeder have a pause feed feature like the previous model? For trips and etc or would you need to remove the schedule on the app. Hello, if you use batteries you just need to remove them from the feeder and this way the unit won’t dispense. I notice you mentioned that slow feed only does a minimum of 1/4 cup. I was hoping it would do this for 1/8th. Did you learn this from experience or do you have source material that I can look at? I can’t find this anywhere. My cat eats so fast and I thought I finally found the right product but 1/4 is too much in 15 minutes for her. The 15-min delay can be set up if you feed your pet more than the minimum dispensing at once so the conveyor spaces out in between the minimum amounts of food.